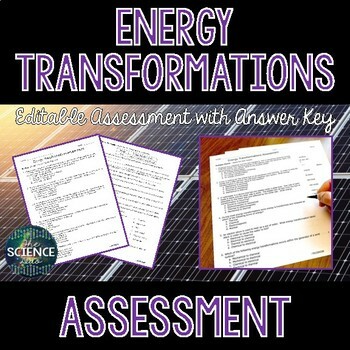 This Energy Transformations Science Assessment will help to support important science content while offering an effective summative assessment for your students. 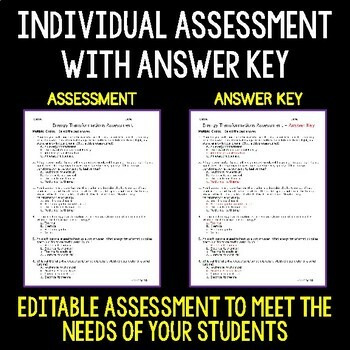 This resource comes with a fully editable pre-made 25 question assessment and 2 versions of the answer key - complete and quick check formats. A variety of question formats are included - multiple choice, matching, fill in the blank, true/false, and short response. 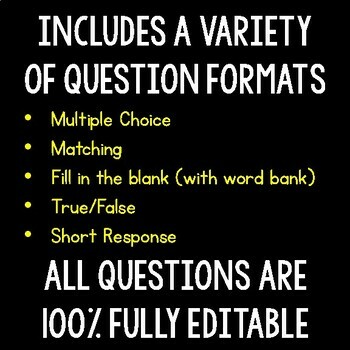 Also included in this resource is a question bank containing 45 editable questions and answers (25 of these are contained in the pre-made assessment). You are free to add, remove, or modify any of the questions to fit your needs. Check out the preview for more details!